Set among the many mansions on Newport’s Bellevue Avenue, Rosecliff was often the setting of lavish parties, including an evening featuring famous magician Harry Houdini. But the property wasn’t always quite so grand. The story begins in the late 1880s when Nevada silver heiress Theresa Fair Oelrichs spent a summer in Newport and met her husband Hermann Oelrichs at Rosecliff. A year after they were married, the couple bought the mansion and additional property along Bellevue Avenue. In 1899, the couple hired an architect and commissioned a home modeled after the Grand Trianon, the garden retreat of French kings at Versailles. It took three years to complete at a cost of $2.5 million. Rosecliff’s last private owners, Mr. and Mrs. J. Edgar Monroe of New Orleans, later donated the furnished home to The Preservation Society of Newport County in 1971. If you find the estate looks amazingly familiar on your first visit, don’t be alarmed. Scenes from many movies, including The Great Gatsby, True Lies, Amistad and 27 Dresses, were shot here. An audio tour is included with admission to Rosecliff. Plan for an hour and a half to explore the estate. The operating schedule at Rosecliff varies according to the season, and free off-street parking is available. Children are welcome, but strollers are not permitted inside the mansion. 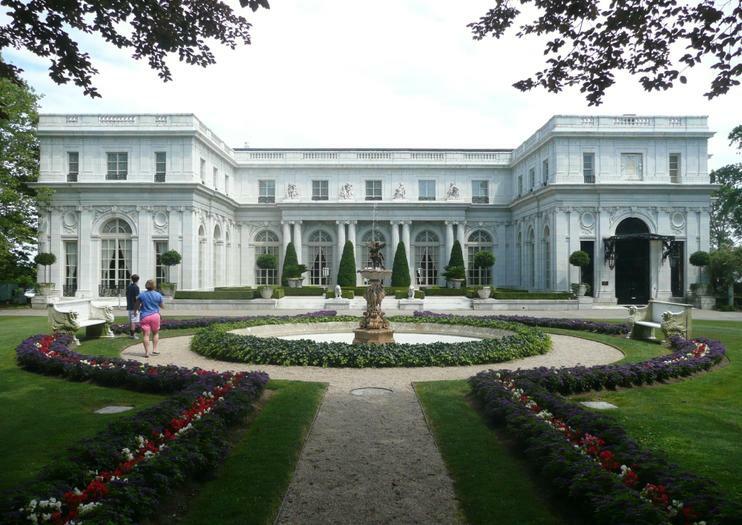 Visit one of Newport's gorgeous Gilded Age mansions on a trolley tour that includes admission to Marble House, The Breakers, or Rosecliff. Choose the one that interests you most, taking in antique art and furnishings that are a fascinating glimpse of daily life in historic Newport. And since the trolley tour explores Ocean Drive and Bellevue Avenue, it's a great way to get an overview of the city's exclusive neighborhoods and beautiful coastal scenery, with an onboard guide to share Newport facts and history as you explore. Hop into a pedicab for a private tour of Newport, Rhode Island. Your personal guide, who navigates through the area for you, tailors the tour to your interests and provides little–known anecdotes about Newport’s rich history. Unlike bus and shuttle tours, pedicab transport affords you unobstructed views of the scenery and plenty of photo opportunities. Flash back to the Roaring Twenties at a film screening of The Great Gatsby in Newport, Rhode Island. See the classic 1974 romantic film starring Robert Redford and Mia Farrow on the big screen at the Jane Pickens Theater, one of America’s oldest theaters, and tour the historic Rosecliff Mansion where the movie was filmed. Your tour package includes entrance fees and continental breakfast at the theater.